After having launched Wireshark with success, we are ready to examine the Wireshark platform in order to use this fantastic tool. Below, a screenshot taken when the 192.168.1.2 machine surfs on the "openmaniak.com" web site. - "Help" Opens or save a capture. Finds or mark packets. Configures the global preferences. Configures the Wireshark platform view. Reach data inside the capture. Sets capture filters options and starts the capture. Finds local or online support. Useful shortcuts are available just below the menus. Information can be obtained when you move the mouse pointer over the icons. The display filter is used to search inside the captured logs. Do not confound the capture and display filters. For full details, check the Wireshark filters tutorial. The packet list pane displays all the captured packets. You can get information such as the source or destination MAC/IP addresses, the TCP/UDP ports number, the protocol or the packet content. If an OSI layer 2 packet is captured you will see MAC addresses in the source and destination columns and, of course, nothing in the port column. If an OSI layer 3 or upper packet is captured you will see IP addresses in the source and destination columns. The port column is populated only if the packet is at the layer 4 or upper. The packet details pane gives in depth information about a packet selected in the packet list pane. The information is displayed per OSI layer and can be expanded and collapsed. On the screenshot below, the HTTP information is expended. 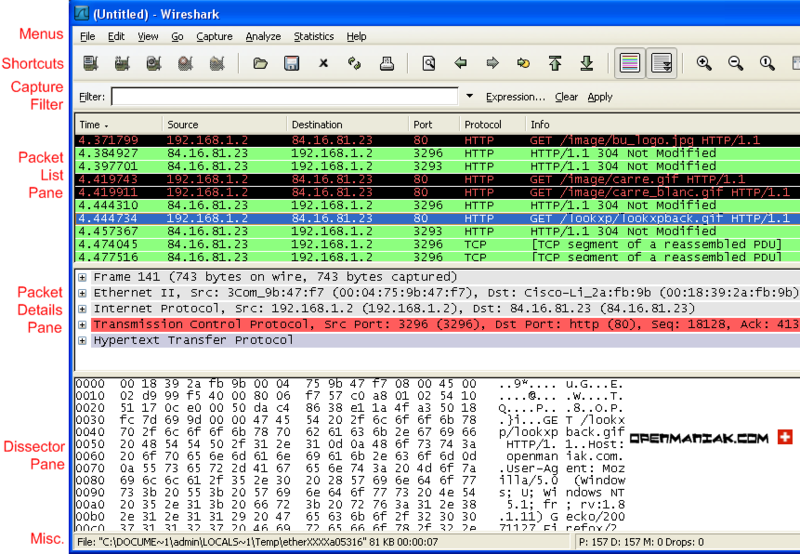 The dissector panel also called "packet bytes pane" by Wireshark, displays the same information as those provided on the packet details pane but in the hexadecimal style. In the example above, we selected the TCP port number (80) in the packet details pane and its hexadecimal equivalent is automatically displayed in the dissector pane (0050). - The network card used for the capture. - If the capture is running or stopped. - Where the capture is stored on the hard drive.